On a recent trip to Belgium, I was not only captivated by the multitude of perfectly manicured hedges ordaining the yards of every pristine brick house, but also by the enormity of the cycling culture. Every day, in any type of weather, cyclists can be seen riding around town. They are young, old, pudgy, and thin, pedaling to work, the store, picking up laundry, or just leisurely riding along enjoying the freshness of a new day. In every picturesque small town in Belgium, red paths, or specific lanes for cyclists connect throughout the city. Every path is clearly marked, and the concrete smooth and maintained. Cyclists have their own traffic lights, and outside of every store or business a bike rack is conveniently located. Belgium is truly a commuting cyclists dream. Riding the safe bike paths of Belgium was pure relief and enjoyment after commuting on treacherous roads in the US and South America — roads that were built with complete disregard to a cyclist, or pedestrian. If you’ve ever faced the arduous task of navigating your bike through a busy city during rush-hour traffic without a bike lane, or tried to maneuver your way to a traffic light while avoiding an obstructive concrete barrier then I would definitely recommend a visit to Belgium. One morning I was in utter disbelief watching swarms of senior citizens pedaling their way through a town. It was after a recent snow storm and frigid temperatures that would make even the toughest cyclist want to huddle in front of a fireplace. I saw nothing but a sea of grey hair flowing swiftly past, with some ladies sporting new frocks, tights and high- heeled shoes. Not far behind this old folks brigade was at least 100 children on their way to school; riding in packs with barely a fingers space between each handlebar. It was an impressive sight, especially compared to the US where even on some of the nicest days you wouldn´t see anyone commuting by bicycle. I remember recently, in the US, being told that I was not allowed to ride my bike through the bank drive-up window. The teller said I could be hit by a car. The other day I saw a newly posted sign prohibiting bikes on a wide sidewalk by my house. While riding to the gym I hopped on a sidewalk where the road shoulder was tight and dangerous. I was accosted by a blaring horn and a furious passing motorist. Last summer, while riding my bike to work I was honked and swore at by a driver of a Ford Excursion towing a large water-ski boat. This would never happen in Belgium. By experiencing and contrasting the cycling culture of Belgium with that of the US I feel that serious improvements still need to be made. Although many cities throughout the US have devoted considerable resources to enact changes in civil engineering for cyclists, they are still so far from making a serious difference in the public’s commuting habits. 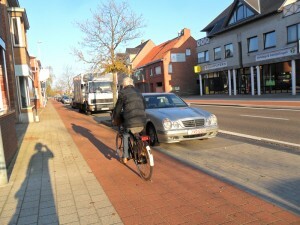 From what I observed, Belgium´s cycling culture enhances the community and promotes a peaceful society. The people are healthier because they ride their bikes so often. They ride for social occasions as well, which enhances the congruity and strength of the community. Motorists are extremely polite and drive with a reserved awareness. Everyone in the community knows that at any time, day or night they may encounter a fellow cyclist, so it seems they curtail their driving habits accordingly. I must confess that I feel a twinge of envy observing the cyclists in Belgium. I can´t imagine many of its citizens realize how fortunate they are to have such an ideal country dedicated to encouraging and fostering the use of bicycles. To the people of Belgium; cycling is simply a way of life. I hope one day the US will look toward Belgium as a model of the multitude of benefits a community based on cycling has to offer.